By stymiedny, October 8, 2015 in Northeast U.S. While out on a beautiful day in the Great South Bay, cruising at around 33Mph all of a sudden the boat started slowing down. I pull up on the throttles and notice one engine has stalled. Tried starting, it turned but never started. Opened hatch and noticed engines were wet and water was running out of the fuel cooler/separator where the petcock is. I went to turn the petcock and the wing broke off leaving the body in the unit with a hole and water running out even with the engine turned off. Got back to dock on one engine and havent seen the boat since. I have had 2 authorized Merc dealers tell me that both engines are shot because they ingested water from this petcock. Engines have 120 hours and all diagnostics run show zero abuse and nothing out of the ordinary. Mercruisers response is not their problem because engines are out of warranty. Boat is 3 years old and engines have been serviced as recommended. As I said earlier 3 years is equivilant to 9 months where I live. 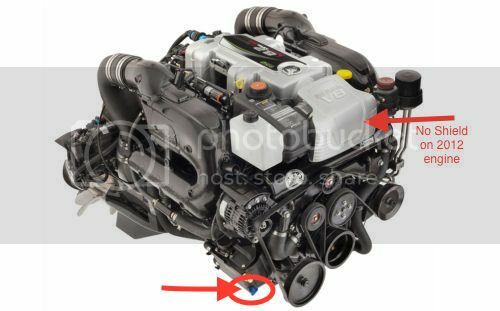 I cannot believe Mercruiser will put their brand reputation at risk by using these $2 plastic drain plugs. I am told that these 8.2L big blocks are approx $20k new without labor. I have been sick over htis for 2 months now and am still waiting for an answer from Mercruiser because I escalated the problem. Maybe this will draw attention to other that might have experienced similar issues with these blue plastic plugs. Do not understand a thing you said about a petcock (a seacock?) and what this has to do with the blue plugs and engine breakdown but this sounds like an accident that lead to engine(s) failure. One thing that comes to mind is to call your insurance broker and start a claim with your insurance company, if it is not too late. I am sorry about your situation and I wish you all the best. I don't understand how the Drain plug on one engine affected the other engine? Is the dealer you bought the boat from the same dealer that has told you to replace both engines? I, too, don't understand how both engines can ingest water due to a drain squirting water into the bildge at the side of one engine. I could see maybe the ignition getting wet and making an engine konk out, but............. The cooler water can't interact with the fuel. There certainly must be something more to it that we haven't been made aware of. Anyway, hope you can get the insurance to make good on it after you plead your case to them. so the port engine lower drain plug failed and while under pressure from the water pump sprayed water throughout your engine compartment. water was then pulled into the engine via the air intake and then mixed with the fuel & air in the combustion chamber. This then created a backfire of sort? did this crack both engine blocks? is that what the mechanic is saying why it cannot be repaired? I do agree that it is odd to see a plastic plugs on the engine. The volvo has the same set up as the basic blocks are the same. That really is a bad chain of events, hope your insurance will cover it as the warranty will not. When my lower unit blew up the warranty covered the parts but only what they deemed fair for labor. i still paid $2k out of pocket to get my problem fixed - warranty issue!! I would think between the flame arrester and the intake cover, water would have a hard time getting in. If water did get in, I could see needing new injectors. But a whole new engine? Yea that sounds a bit strange to me... I once had a small hole in the top of my starboard hose once.. The very top one that connects to the thermostat housing. I had no idea it was leaking until the forward bildge pump started spewing water out the side. ( rear pump didn't work).. I opened the hatch and water was EVERYWHERE. My engines are still fine.. I fixed everything but still not sure how you ingested water. Plus you got home on the 1 engine so how is that shot? Wow, I'm really saddened to hear about your situation. I also agree that it sounds fishy that both engines are shot from this failure. I wish you best of luck with this. When I started to see the cost was going to add up I brought it to the dealer I bought it from for a second opinion. They ran the same test for mercruiser and result codes were all over the map. The one engine that wouldnt start, after replacing oil and plugs started but after a few minutes blew the dipstick out and was deem bad. Although the starboard runs it too is demonstrating faulty codes as if it has to be replaced. I don't blame you at all for being sick to your stomach over this but TRUST me, this is not as awful as you think because this is certainly insurance related. Besides, you can find a mechanic who will come and fix both engines (unless you're telling me one is cracked) for a SUPER FRACTION of what those crazy new number you quoted are. Relax, take a DEEEEEEEEEEEEEEP breathe and first off find if your insurance is willing to cover the repairs, not a new engine (don't go there just yet), just tell them very specifically what happened and see if they can assist you in anyway by finding someone to take it to. I hope this helps you because even if the water from one engine squirted allover the other, that is completely repairable and forget about those rip off dealers or even Mercury or Volvo they'll all want you to buy new and there is NO NEED for that. It sounds like it can be repaired for MUCH MUCH MUCH less than 2 new big 8.2's but you need to contact your insurance first! Have you done that yet? A month in the process? Then you know what I would do? If you don't have the time, have the lovely Missus call them every other day and see where they are at and just politely ask them that you plan a big trip and need this fixed asap. Stay on top of them I'm telling you don't worry and don't stress it's not as bad as they're telling you. This guy is who was at my house is a certified Volvo Mech and he told me the shenanigans not only VP does, but also Merc. So fight hard and stay persistent. A lot of guys out there who can easily fix that with a much less amount than buying 2 new motors (I think that is beyond ridiculous) and you'll be fine. But stay on those insurance guys don't you have a big trip coming up? Seems odd how did the boat get from one mercury dealer to another if not on the power of the second engine. Is one engine still running. Did they do anything to mitigate damage if they though saltwater got in. Seems like that should have been the first step. Still does not make sense that it was not simply a sensor that stopped the engine due to a water pressure drop when the peacock failed. As for water getting into the air intake on the other engine that sounds like pure BS. I had over a foot of water in my engine compartment when my intake hose came off the water pump water everywhere bilge pump kept it down but not completely dry. Just checking in to see how you're making out with that difficult situation. I hope it was resolved without you having to pay for 2 new or rebuilt 8.1's. Best of luck and keep us posted. FYI - I am assuming you are referring to the blue plastic drain plugs located on both sides of the engine? total of 4 - 2 on manifolds and 2 at base of block? Good for you, man. I was admittedly a little concerned about your situation and left that "check-in" post for you but hadn't heard until now, so I figured you either got some bad news or were still in the process. Those red 327's are terrific. Interesting, even though I only have 1 engine, but my mechanic did the winterizing and your idea is a good one. Just a quick double check to see it they've been threaded back on properly and are in good condition is nothing, considering what could result in a bad one or two. Hopefully this image will clarify your questions. The drain plug is by the seawater pump that cools the fuel. The drain plug broke while engine was running about 35Mph. Seawater spewed throughout the engine compartment and was ingested by both engines. One engine finally stalled while I was moving giving me the first sign that there was a problem. It looks like Mercury now has a shield over the intake screen to prevent such an incident now. You'll have to let us know what you get at WOT once the new motors are broken in. I'm just curious to see what the numbers would be for a boat like that and new Mercs. 52 mph sounds about right in perfect conditions. Our fully loaded 350 will do about 48 WOT. More importantly, they run well at lower RPMs. Wow, that's pretty impressive. Would love to see if the new motors give you at least that same speed, maybe more. Either way, glad it ended up working out for you besides the down-time it will take. Either way, if it cuts in on a bit of boating time that's ok. Better than the other option for sure!